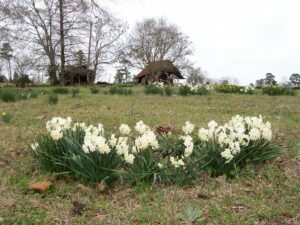 Yes, I know this blog entry is late, but I’ve been in my annual Narcissus stupor, having just returned from a daffodil lecture, flower show, and photo contest in Ruston, Louisiana. February was a busy month and the past week even busier. Thankfully, my Texas A&M AgriLife Extension job in Smith County will do a better job of tethering me in the future so I won’t be running all over the country giving talks. I’ll have to save that for retirement. 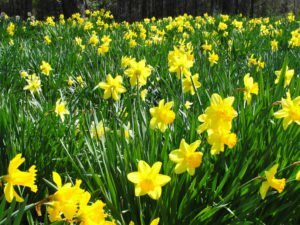 Due to an incredibly mild winter, the spring bulbs were very early this year leading to a number of daffodil shows being cancelled across the country. Thankfully, there are early, middle, and late season daffodils to provide several months of bloom. I mainly grow early ones that have long since finished blooming this year. My typical peak bloom is the last weekend in February, but this year was about two weeks early. Unfortunately, right in the middle of the mild winter was a brief but very hard freeze that zapped my tender tazettas. Anyone who knows me is aware that I’ve had a life-long love affair with flower bulbs. I was even chastised in kindergarten by Miss Gilbert at Peggy Ann’s school in Longview for including tulips in all of my artwork. I went on to play a little Dutch Boy, costume and all, with a cast of other “Dutch” children (including my sister) in front of a big windmill at our school play that year. Miss Gilbert strongly suggested that I diversify into other flowers, and that I did! Thanks to the many old homeplaces in my East Texas ancestral hamlet, I found many assorted heirloom Narcissus and zero tulips. That’s because the climate in most of the South works primarily on a wet-dry cycle like the Mediterranean region instead of a warm-cold cycle like Holland. So what are Narcissus you ask? Narcissus are members of the amaryllis family (Amaryllidaceae), most likely my favorite family, and are native to Europe and the Mediterranean. There are over 50 species, but not all are adapted to the mild winters and hot summers in the South. Botanically they all belong to the genus Narcissus, named for the son of the river god Cephissus and nymph Liriope who couldn’t get over himself in Greek mythology. He’s the one that stared at his reflection in the water until he turned into his namesake flower. Because of this stupor, the word narcotic derives from narcissus as well. Botanists refer to all varieties in the genus as Narcissus. This oversimplifies the diversity most gardeners see and experience. The American Daffodil Society (daffodilusa.org) refers to them all as daffodils, which to me is a deceptive oversimplification too. They even divide them into 14 different categories, which in my humble opinion is an over-complication for the average gardener. Making matters even more confusing are those in some parts of the South who refer to them all as jonquils or “johnny quills” as one of my former aunts used to say. However, if you are going to be one of my “beginner” horticulture students, there are three fairly distinct categories that I want you to learn and use. 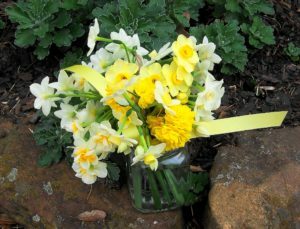 The first category is “narcissus.” These belong to or descend from polyanthus flowered Narcissus tazetta. They have white or creamy white, obnoxiously fragrant flowers in clusters and tend to bloom early in the season. They have very small cups in the flowers, which is the trait that inspired the species name tazetta (“little cup”). They have been called “narcissus” for thousands of years now, so who am I to challenge the name. 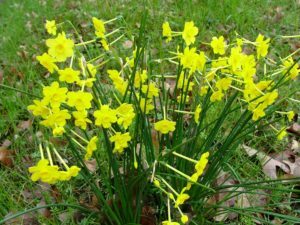 The second category is “jonquil.” They belong to or are hybrids of Narcissus jonquilla. These have clusters of small yellow flowers and a strong sweet fragrance. They too have very small cups. The species names jonquilla is a corruption of the Juncus genus because of their similar rush-like foliage. The final category is “daffodil.” They hail from Narcissus pseudonarcissus. These are mostly yellow with one flower per stalk, a large trumpet in the middle of the flower, and little to no fragrance. The name “daffodil” is more modern than narcissus. But to be quite honest, it really doesn’t matter what their names are or what you call them. What matters is that they live and give. I just remembered that I left out the most important part of my talk in Ruston! There are many daffodils that will bloom well the first year and sometimes even for ten years. 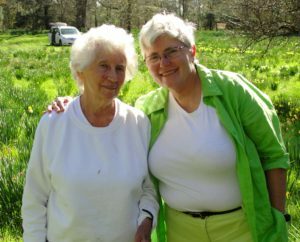 But many of the larger, showier daffodils and kin stop blooming in the South. So when I recommend a specific type, I want to know for a fact that it keeps blooming for at least 20 years and preferably 200! And like it or not, many of the most adapted types for Texas and the Southeast are smaller wild species, early hybrids, and pass-a-long heirlooms. Though they might not be as gaudy as the buxom show girls, they do retain the grace, charm, and vigor of wildflowers. PS: Mark your calendars. The Smith County Fall Bulb Sale and lecture will be Saturday, October 14, 2017 at Harvey Hall at the Tyler Rose Garden and will feature proven heirloom Texas grown bulbs along with yours truly lecturing about them.